I’ve always believed that God has a purpose or a plan for all of us. We are on this earth for a reason and we may go through life not knowing what our mission on earth is. Through prayer, meditation, soul searching and listening to our own intuition we can find out what God’s plan for us is. 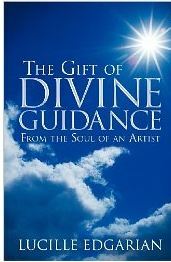 Lucille Edgarian shares her story on how she learned to trust her “Spiritual Guardian” to help guide her through life’s difficulties in the new book, The Gift of Divine Guidance, From The Soul of an Artist. As a child during the depression her mother having to raise three children alone and without enough money to support them was forced to send Lucille and her sister, Theresa to a convent and their younger brother was sent to live with relatives. The nuns at the French convent where the young girls lived were strict and abusive. During this tough time the young girl learned how to reach out to her “Spiritual Guardian” by focusing on a light source. Edgarian describes her spiritual growth from a young girl, to young adult and the challenges she faced later on in life. I found Edgarian’s story inspiring and uplifting. After reading this book I am beginning to question my own spirituality and what my mission is in this life. Everyone is faced with their own difficulties and obstacles in life. The way we deal with what is thrown at us in life is what builds our character. Through prayer and meditation you can reach into your soul and find your own “Spiritual Guardian,” just like Edgarian did. If you are going through a tough time in your life, whether it is losing your job or home, or dealing with a death of a loved one or maybe an abusive relationship, you must read “The Gift of Divine Guidance, From the Soul of an Artist. “When we discover our spiritul side, there is no limit as to what we are capable of. I owe my sucesses and sanity to the divine help I received from my spiritual guardian,” says Edgarian. Today, Lucille Edgarian is a professional artist, author and entrepreneur. She pursued art studies at the American Society of Fine Arts and the Corcoran Gallery of Art in Washington, D.C and she was Profesor Pio Rossi’s first female apprentice in Pordenone, Italy. Edgarian is a past president of the San Antoio Chapter of The National Society of Arts and Letters and has also searvedas the National Art Chairman for two years. Edgarian is also a signature member of the Texas Watercolor Society. After reading this book I’ve learned that if I take the time to pray and meditate more often I can also reach out to my own “Spiritual Guardian,” whom I would rather refer to as God or Jesus, my savior, and listen to the plan He has laid out for me. You can purchase The Gift of Divine Guidance: From the Soul of an Artist by Lucille Edgarian online at Amazon.com . *Disclosure: I received a copy of The Gift of Divine Guidance: From the Soul of an Artist by Lucille Edgarian in exchange for this review. All opinions are accurate and 100% mine.